When someone reports an EC2 connectivity failure, what do you do? Open your Amazon VPC Console, launch an SSH session, and start typing CLI commands in search of clues. Moreover, in many cases, networking is not an issue, but valuable time is lost eliminating the network as a cause before you can progress. Unfortunately, AWS does not natively provide the visibility and troubleshooting features needed by CloudOps and DevOps teams to identify and resolve problems quickly. As part of our fact-filled AWS Bootcamp series, Aviatrix CTO Sherry Wei and Neel Kamal, head of field operations at Aviatrix, show you how to get on top of these issues and achieve operational readiness. They also demo tools that give you visibility, simplify troubleshooting, and alert you when issues are detected. CloudOps, DevOps, Cloud Architects, Cloud Network Engineers, Cloud Support teams, or anyone responsible for connectivity of cloud resources. As you complete your plans for moving IT infrastructure and application workloads to Azure, it’s important to understand what connectivity and security services Microsoft includes by default – and what’s missing. Though Azure comes with baseline capabilities, it’s still up to you to choose judiciously among many Azure-native and third-party options to address unique requirements. This session explores use cases, such as encrypting traffic between VNets holding sensitive data, remote user access to VNets, multi-cloud connectivity, and filtering egress traffic to the Internet. They then demonstrate how a software-defined approach can deliver simplified and unified control over cloud routing, embracing both Azure-native and third-party services. Anyone responsible for connectivity of cloud resources, including cloud architects, cloud infrastructure managers, cloud engineers, network security and networking staff. There are legitimate reasons why AWS VPCs or Azure VNets need Internet access; for example, to receive software updates from vendors or integrate with native AWS services or third-party SaaS services. But this is substantially different from an on-premises use case, where traditional, full-featured firewalls are needed to filter co-mingled end-user traffic and application traffic. And while AWS provides a NAT gateway, it can be configured only on a per-VPC basis against a limited number of IP addresses. - Build IPsec tunnels to, for example, support API connectivity or secure data as it moves between an on-premises database and the hosted app. - Provision your customers’ administrative and end users with easy yet secure app access. - Ensure internal teams have secure access to perform maintenance and support. Now imagine doing all that for dozens of customers… or hundreds… or thousands. Not to mention your DevOps team, which needs isolated development and QA instances from which to build and deploy ongoing releases. 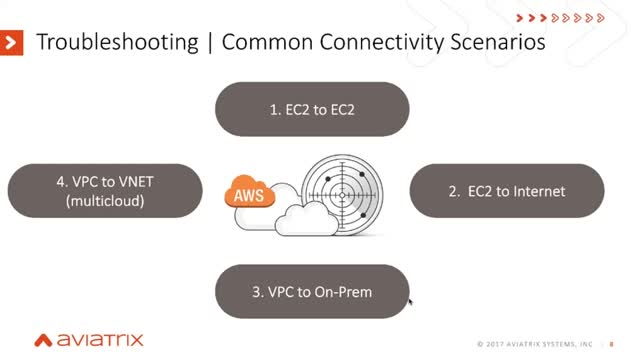 As part of our fact-filled AWS Bootcamp series, Aviatrix CTO Sherry Wei and Neel Kamal, head of field operations at Aviatrix, review the security and operational requirements for implementing automated VPC networking to meet customer expectations while enabling your own internal teams to do their work both inside and separate from customer instances. As part of our fact-filled AWS Bootcamp series, Aviatrix CTO Sherry Wei and Neel Kamal, head of field operations at Aviatrix, share the requirements that our most successful customers have insisted upon for their Global Transit Networks, and demonstrate the key features that deliver on those requirements. - Visibility: Do you have a way to centrally view your network, see performance bottlenecks, control security policies, and set other configuration details? - Deep Analytics: Can you easily gather performance and audit data and export it to Splunk, DataDog, or other advanced reporting tools? - Monitoring and Troubleshooting: Do you have a real-time view of network health, and how easily can you access the data needed to locate and fix issues? - Alert Management: When issues do occur, what real-time alerting is available? Public cloud providers like Amazon AWS enable software providers to build and offer software-as-a-service. These SaaS providers are often plagued by networking challenges owing to multi-tenant requirements, different connectivity types and strict security & compliance requirements. There has to be a simpler way to solve networking requirements for the cloud other than the legacy hardware-based networking solutions. Join us in this webinar to hear from a cloud expert, Richard Weekes, Enterprise Analytics & Mobility Provider, Microstrategy, where he architected an elegant cloud networking solution to address the 4 common pitfalls for SaaS providers. RobertHalf automates Hybrid Cloud deployment on Amazon AWS with Aviatrix Hybrid Cloud eXtend (HCX) software to reduce the time to deploy virtual private cloud (VPC) resources from 3 weeks to 30minutes. Watch the video to learn how from the solution architects of RobertHalf. Cloud migrations are happening everywhere but are ripe with project delays, complex and time-consuming hardware-based networking and a lack of cloud skills to make them really successful. Not to mention extending your cloud is just as challenging. What if you could set up and manage clouds in a few minutes and accelerate your cloud projects? Join the discussion where you will hear from one of the most foremost authorities on cloud, Chris McDaniel, SVP & Chief Infrastructure Architect at Integnology, who helps enterprises with their cloud strategy and migration path. “Traditionally, Enterprises deployed business critical applications in their private data centers. To leverage the scale, agility and cost efficiency offered by the public clouds, Enterprises are migrating the workloads to public clouds like - Amazon AWS, Microsoft Azure and Google Cloud Platform. Seamless access to critical workloads needs a hybrid cloud network that has datacenter extended to the public cloud”. GREE International Entertainment, Inc., a leading free-to-play mobile social gaming company, is using Aviatrix Enterprise Cloud-defined Networking software with Amazon Virtual Private Cloud (VPC) to accelerate game development and time to market. Aviatrix system, pioneer in innovative solution that simplifies scales and accelerates all types of secure connectivity to the public cloud. Aviatrix’s Hybrid Cloud Networking solution is built from the ground up for Amazon AWS, Microsoft Azure and Google Cloud Platform to realize the benefits of agility, scale, and flexibility.